BJP’s Rajesh Kalia has been elected as the new Mayor of Chandigarh after defeating party rebel Satish Kainth. Out of 27 votes, Kalia got 16 votes while Kainth got 11. Congress candidate Sheela Devi withdrew her name just before the election. Rebel candidate Kainth refused to withdraw his nomination despite efforts by senior leaders of the BJP making the election for the post of Mayor a major challenge for the ruling party. Of the 26 elected councillors, the BJP has a majority in the Chandigarh Municipal Corporation with 20 councillors. However, the infighting had made the election interesting. The BJP also had the support of an SAD councillor. 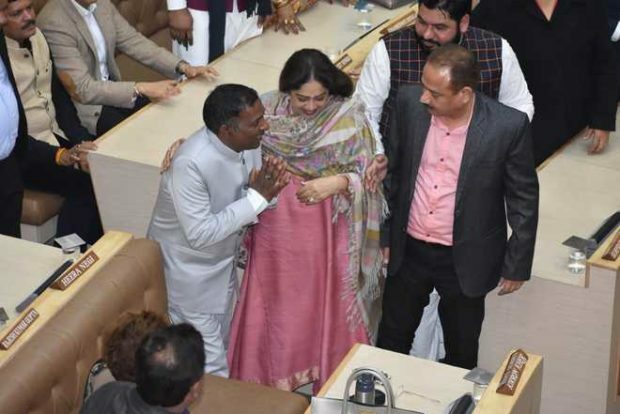 Member of Parliament Kirron Kher also has a vote being an ex officio member of the House. The Congress has only four councillors, one councillor is an Independent. Kalia represents Ward 7 in the MC. He was elected to the House for the first time in the 2016 elections. He had lost the first MC election on the BJP ticket from Dadu Majra in 2011. His “involvement in criminal cases” has been highlighted recently, but he has claimed he has been given a clean chit in all cases.